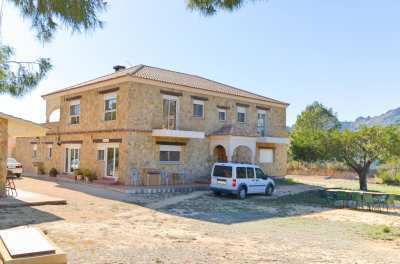 The main house stands on 2 floors and boasts large terraces from which to enjoy views of the mountains and the valley . Inside, you find a spacious income hallway with guests toilet and an impressive staircase. A lounge with fireplace, french doors to the courtyard, luxury dining kitchen with all fittings and a woodburner , 2 bedrooms and 2 bathrooms. The master bedroom is very spacious with an ensuite full bathroom ad a dressing area. All on the ground floor rooms have windows and doors to the outside to the huge naya and the courtyard .An impressive summer kitchen with bread oven, the place to entertain in the summer. Next to the summer kitchen is an extra bedroom with shower room. There is a huge garage with space for 3 cars and the tractor. Outside, the house has several summer terraces, a romantic garden, and access to the pool 10 x 5 m which is immersed in the spectacular scenery that surrounds it. The guest apartment on the ground floor has a living room, kitchen, double bedroom and a bathroom. It also has a mains electricity and water connection. Underfloor heating . PVC window frames with double glazing. This is a quality very private property which has been well maintained and would offer any purchaser a home to be very proud of.